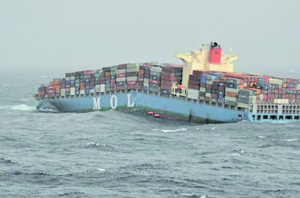 Focus for the investigation into the causes of the break up and subsequent loss of MOL Comfort has turned to the structural strength of the vessel and the declared weight of containers. According to investigators from the Committee on Large Container Ship Safety in Japan, which is investigating the causes of last year’s accident in the Indian Ocean, the time has come for the industry to start weighing loaded containers to determine their actual weight, rather than relying on shippers to declare the correct weight of a container. In fact this is not the first time an investigation into the loss of a vessel has reached such a conclusion. In January 2007, while travelling in the English Channel MSC Napoli encountered heavy weather, with wave heights of up to 9m, while travelling at a speed of around 11knots. At around 11am that morning Napoli suffered catastrophic hull failure causing the crew to abandon ship. As a result MAIB said that the stresses on a vessel’s hull cannot be “accurately controlled” unless containers are weighed before loading. Screening of more than 1,500 container ships by class societies took place following the report on the Napoli loss and a further 12 vessels were found to have localised buckling as a result of insufficient strength for the hull structure to cope with certain loading conditions. As a result container ships are sailing at either above or close to the permissible the maximum loading limits. “Container shipping is the only sector of the industry in which the weight of a cargo is not known,” says the MAIB. Mitsubishi Heavy Industries, the builder of MOL Comfort, believe that these issues will eventually be seen as a significant contributory factor to the loss of the vessel. Surly it is time for all containers to be weighed and for accurate measurements to be available to master prior to sailing?